A Maine district wants kids to do schoolwork on snow days. The state won’t let them. 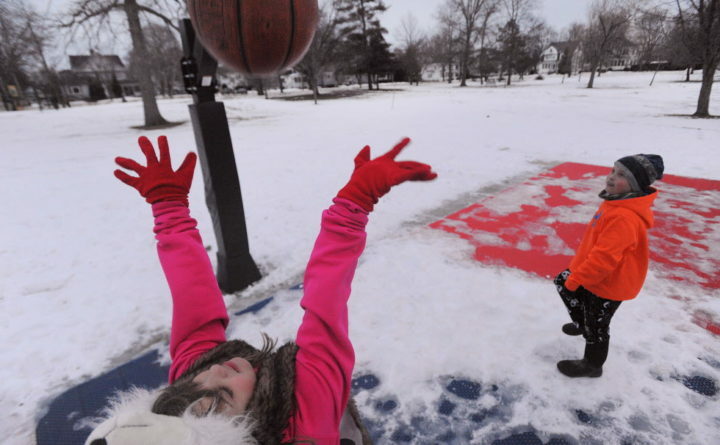 Lillian Young of Bangor (left) takes a shot at the basket while shooting hoops with her twin brother Gavin Young (right) and their father Rob Young (not pictured) at Fairmount Park in 2013. Due to restrictions from the Maine Department of Education, school administrators in the Camden-Rockport area likely will not be able to try replacing two snow days with “remote school days” until the end of the winter, if at all this school year. For months, officials in the combined School Administrative District 28 and Five Town Community School District have been planning a remote school day pilot project that would allow students and teachers to work from home when inclement weather keeps them out of school buildings. Administrators hoped to implement the remote school days for the first two storms to hit after Dec. 1. But last week the Maine Department of Education denied the district’s request for an exemption from the 175-day minimum school day requirement, according to MSAD 28 and Five Town CSD Superintendent Maria Libby. “Quite honestly, for me it’s really frustrating, particularly given the amount of time and effort and thoughtfulness that we have put into developing this pilot [project] and how to go about it,” Libby said. In addition to denying the request, the DOE released its guidelines for what it calls “Anytime-Anywhere school days,” or remote school days, in a newsletter last week, in response to “a number of inquiries about the use of Anytime-Anywhere school days and learning,” according to the newsletter. State education officials do not currently accept remote school days as a way to make up or hold a school day unless a school district meets several requirements. A school board must approve the plan prior to the school year. Remote days must be included as part of a waiver in relation to school cancellation. And administrators must ensure that schoolwork done on remote days is age appropriate, among other requirements. For Camden to follow through with its remote school day pilot project this year, the DOE is mandating that the remote school days only occur after five regular snow days. So far only one snow day has been called for Camden Hills Regional High School, and no snow days have been called for schools in the Five Town CSD, Libby said, meaning it could be awhile before the districts reach the threshold. Libby is worried the districts might not get a chance to try the pilot project school officials spent time and resources to plan. The whole point in having the remote school days be used earlier in the winter was to ensure “[the schools] had the time to experiment and improve it,” Libby said. Libby plans to appeal the DOE decision in January, when a new administration takes over. She has not lost hope yet, but is discouraged that the state would not allow a district to at least try something she considers beneficial to students and teachers. Libby believes remote school days are a better option for student learning than tacking on additional days in June or extending the school day in order to make up for snow days. While SAD 28/Five Town CSD is one of the first public school districts in Maine trying to implement remote school days, the Baxter Academy for Technology and Science, a Portland-based charter school, has been working with the DOE and the Maine Charter School Commission on snow day learning for years. Baxter Academy’s outreach coordinator has said that last year, participation rates in “snow day learning” were so high that students and staff were granted four school days that they did not have to make up at the end of the year. Rachel Paling, director of communications for the DOE, said the Maine Charter School Commission has flexibility over the school calendar as required by law. Paling said remote school day learning has “been of interest by some of Maine’s districts” for a few years and that the department is currently exploring the topic. “We are in conversations and exploring data to ensure equity and best practices around this topic. We anticipate further information and guidance to be forthcoming in the winter and spring of 2019,” Paling said in an email.